The Department of Materials Science and Engineering (MSE) at The Ohio State University enjoys the respect of industry leaders and academicians world-wide. The international reputation of its faculty, its extensive research facilities, and the impressive expertise of its graduates continue the tradition of excellence. By selecting Ohio State, you will learn from some of the most eminent researchers in the nation and have access to facilities that house more than $30 million of the most advanced research technology equipment available. The current MSE Department has two former departments in its roots: the Department of Geology, Mining and Metallurgy, which was founded in 1873, and the Department of Clayworking and Ceramics, founded in 1894. Faculty of Ohio State's newly formed Department of Materials Science and Engineering (c. 1989)These two departments evolved and expanded over the decades--modernizing their instruction, their research and their laboratory facilities--to address the growing needs of technology. Professor Mars Fontana was the Chairman of Metallurgical Engineering for 25 years when the department grew from 5 to 13 faculty. Further growth and improvements were realized under Chairmen Paul Shewmon and George St. Pierre. For the Ceramic Engineering Department, Chairmen William Shook and Dennis Readey guided the growth and changes that brought the department into the modern era. By the 1980s, it became apparent that the boundary between the traditional materials disciplines of metallurgy and ceramics was unnecessary and that other such curricula in the world had changed their emphasis, names and degrees. 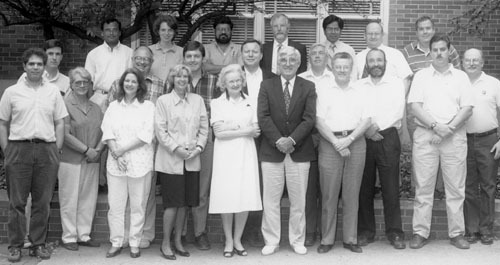 In response to this need to encompass the broader spectrum of "materials," the Departments of Metallurgical Engineering and Ceramic Engineering merged in 1988 to form the Department of Materials Science and Engineering. The new department, which offers several B.S., M.S. and Ph.D. degree titles, provides students with a greater breadth of study and research. Today, the teaching and research span the processing and degradation of materials, and examine the engineering of the chemical, physical and mechanical properties of ceramics and metals, while including studies of electronic and other special materials (biomaterials, superconductors, sensors, intermetallics, advanced composites, coatings and microlaminates). The use of sophisticated, state-of-the-art equipment often is involved in the high-resolution examination of the compositions, structures and defects of these materials. Professors George St. Pierre, Robert Wagoner, Robert Snyder, John Morral and Rudy Buchheit have chaired the Department of Materials Science and Engineering, which today comprises 34 faculty, 260 undergraduates, nearly 160 graduate students, numerous post-doctoral researchers, more than 100,000 square feet of office and laboratory space, and a multi-million dollar annual research budget. Each year, members of the department publish many archeival papers and are named on numerous patents. In addition, both faculty and students continue to earn prestigious national and international awards and recognition. Welding Engineering was established as a department with a B.S. program within the Industrial Engineering Department in 1948. It became a separate department in 1948, and an M.S. degree was established in 1956 and a Ph.D. degree in 1985. In establishing the department, the OSU College of Engineering recognized that engineering for welding requires a uniquely broad set of knowledge. In designing and refining welding processes, operations, and welded products, welding engineers apply knowledge and techniques from the diverse engineering disciplines: materials, manufacturing, design and non-destructive evaluation. Based on this interdisciplinary foundation, with an added technical area of polymers, the department eventually achieved national recognition for its materials joining research and education. The Welding Engineering Department was re-combined with the Industrial Engineering Department in 1994 during a restructuring aimed at decreasing the number of departments in the College of Engineering. It became one of two degree programs within the renamed Department of Industrial, Welding and Systems Engineering. In 2010, Ohio State's Welding Engineering program was transitioned into the Department of Materials Science and Engineering, after being part of the Department of Integrated Systems Engineering. This reconfiguration was based in part on a realization that the research programs of the two departments had evolved in such a way that there was more synergy between the MSE and WE programs and less synergy between the ISE and WE programs than there had been in the past. In addition, welding metallurgy had always been seen as a key component of the WE undergraduate curriculum, partially because of the required MSE course content. The Welding Engineering program at Ohio State University offers the only ABET-accredited B.S. in welding engineering in the United States. More than 1,000 welding engineering degrees have been conferred since the inception of the program, with over 50 percent of those in the past 20 years. Currently, approximately 20 to 40 B.S. degrees are awarded annually. Welding engineering graduates from Ohio State are highly sought after by major corporations throughout the United States, and starting salaries are competitive with the highest of offers in all engineering disciplines at Ohio State.